You are in: Home > News > M-DARTS SPORT CAFE KLANG 501 RANKING ! M-DARTS SPORT CAFE KLANG 501 RANKING ! RM 5000 total cash prizes.Only from 10 Nov to 19 Nov. Don't miss it! 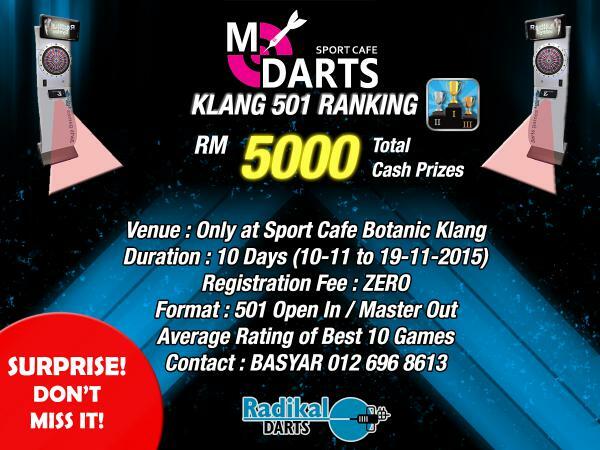 M-Darts is organising a surprise ranking event for M-Darts Sport Cafe Botanic Klang outlet and it is running as you read this news! Total Cash Prizes of RM 5000.00 to be won in just 10 days! Hurry up or you are going to miss it! 2) If there is a tie for feat or placing prizes, the prizes will be split equally among the tied players. 3) An event will be held at M-Darts Sport Café Klang for prize giving ceremony on 21st November 2015. Winner's attendance is compulsory. Winners who unable to attend the prize giving ceremony need to send a representative. 1) M-Darts and MBI Corporation Sdn. Bhd. reserve its right to amend the rules & regulations without prior notice. All decisions made by M-Darts and MBI Corporation Sdn. Bhd. are final. 2) M-Darts and MBI Corporation Sdn. Bhd. reserves its rights to publish or display materials or information, including but not limited to the names of all Participants for marketing, advertising and publicity purposes in any manner it deems appropriate. The Organizer further reserves its right to use any personal data of Participants in any manner and/or for any purpose it deems fit and the Participants are deemed to consent to such use with no monetary payment. 4) Remote Refereeing System will be used to monitor the player's game. 7) If a player throw a dart but the dart wasn't counted, it can throw a new dart. However the player cannot touch the dart in the board with his/her hand else it would have their game invalidated.